Step back in time and look for George Attla’s famous kick among the field of other competitive mushers in footage from two village championship races in Alaska. The video clips were taken by friends of the Attla family. The 2011 New Year’s Men’s Race, held in the village of Huslia, was won by George Attla at age 77. This footage shows four mushers kicking their way to the finish line on the river in front of the village of Nenana, where the race took place. 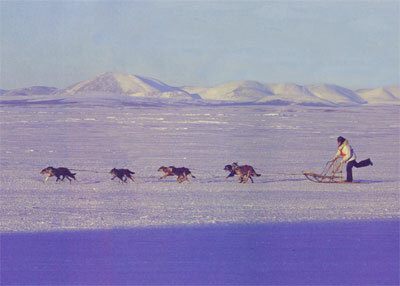 George Attla, who won the race, is the last musher to be viewed by a crowd of spectators. Next see George Attla’s dog truck, his dog handlers, and some celebration activity after the race. This footage of the 2-day New Year’s Men’s Race shows George Attla at the start and end of the first day. George is cheered on at the finish. When stopped, he starts to pull off his racing bib and is congratulated by locals. The last footage is of George crossing the finish line on the second day to win the heat. The next team is George’s second-string driven by Hilary Schwafel.